Düsseldorf Airport, a gateway to the eastern German state of North Rhine-Westphalia, serves the state capital, Düsseldorf. Opened in 1927, the airport has continually expanded to be able to handle bigger aircrafts and more passengers. Düsseldorf Airport can accommodate wide-body aircraft, including the Airbus A380. In 2016, 23.5 million passengers passed through the airport’s doors. Düsseldorf Airport (IATA code: DUS) is the third busiest airport in Germany and a hub for Eurowings. Flights to Düsseldorf Airport are provided by international airlines such as Cathay Pacific, Delta Airlines and Royal Air Maroc. DUS is a 14-minute drive from the city centre of Düsseldorf. Book your cheap flights to and from Düsseldorf Airport online! Start packing your bags for an adventure in Germany with flights to Düsseldorf Airport. Operating with three passenger terminals and two runways, it’s no surprise to see why DUS has become the third-busiest airport in Germany. Düsseldorf Airport opened for commercial flights in 1927. During the Second World War, the military started using the airport in 1939. By 1948, commercial flights resumed. From 1950 onwards, DUS saw greater expansions to its main runway and the construction of more terminals. Today, Düsseldorf Airport welcomes you to the country of Germany and offers you the opportunity to explore more of the European continent! Düsseldorf boasts more than 60 retail outlets where you can browse through a variety of products, including fashion, lifestyle, travel essentials and more. The airport also includes shops selling duty-free items, such as beauty products, fashion, wines, sweets, fragrances and toiletries. All the shopping you can do while at the airport will definitely leave you with an appetite. You’ll be spoiled for choice as to how to satisfy it, with more than 40 bars and restaurants at Düsseldorf Airport. Make sure to follow the baggage restrictions at Düsseldorf Airport. Düsseldorf is home to 5 lounges. The Business Lounge and the Senator Lounge from Lufthansa are situated on the gallery level in Pier A. These lounges are available for easy access for passengers flying with Lufthansa, Germanwings and their partner airlines. The Hugo Junkers Lounge is on level 2 at gate B, in the Schengen area. All travellers can access this lounge after paying the admission fee (only debit or credit card payments are accepted). Priority pass holders also have access to this lounge. At Gate C, in Pier C, there is a designated non-Schengen area, which is home to two lounges. One, operated by Emirates, is accessible to passengers who fly with Emirates. Travellers flying with other airlines can enjoy access to the Open Sky Lounge. 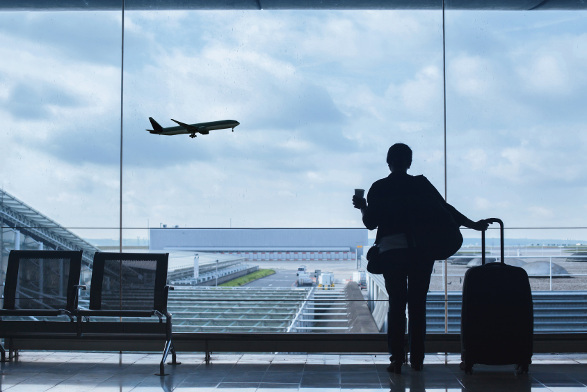 Other facilities available at Düsseldorf Airport include free Wi-Fi, currency exchange offices, ATMs, designated smoking areas, disabled passenger facilities, facilities for pet owners, as well as facilities for children travelling alone. This 3.5-star suburban hotel is a 13-minute drive from Düsseldorf Airport. Amenities include a restaurant, bar/lounge, self-parking, 24-hour business centre, 24-hour front desk, coffee/tea in the common area, air conditioning, laundry service, and multilingual staff. Free buffet breakfast and free Wi-Fi are also available. This 4.5-star luxury hotel is within walking distance of the airport’s terminals. It is home to numerous features, including a rooftop terrace, breakfast, restaurant, fitness centre, 24-hour business centre, limo/town car service, air conditioning, daily housekeeping and 24-hour front desk. Free Wi-Fi is available as well. This 5-star luxury hotel near Düsseldorf City Hall is a 15-minute drive from Düsseldorf Airport. It comprises of several amenities, such as a computer station, air conditioning, 24-hour front desk, terrace, in-room childcare, 24-hour business centre, valet parking, fitness centre, and a restaurant. The accommodation package includes free Wi-Fi. You can order foreign exchange as early as 60 days before leaving South Africa. Take note as you can only collect foreign exchange in person. Change Group Currency Exchange offices are available on Level 0 outside Terminal B and just outside Terminal C. More Change Group Currency Exchange offices are available on the 1st floor in Terminals A, B, and C.
Düsseldorf Airport offers parking for all travellers, no matter what the nature of your travel is, be it business or pleasure. You can reserve a parking spot on the airport’s website. Düsseldorf Airport is situated 7 km north of downtown Düsseldorf. Transport options available to get you from the airport to your destination include trains, taxis, buses and rental cars.